As the F&B Masters competition heats up in Southeast Asia (SEA; including Sri Lanka and the Maldives), the time is nigh for rising F&B talents across Hilton Worldwide’s SEA properties to put their best food and drink forward. Rakesh Shetty of Conrad Maldives Rangali Island has emerged triumphant as the Country Winner of The Barista Cup of the Hilton Worldwide SEA & India F&B Masters 2015/2016. He will represent Maldives at the grand final of the F&B Masters 2015/2016 to be held at Conrad Bangkok from February 15-16, 2016. The annual competition, which aims to celebrate culinary creativity and original mixology, extends to Asia Pacific in 2015 through 2016, following a successful introductory run in Southeast Asia in 2014. Finals of the F&B Masters across APAC will take place in regional clusters namely: Australasia; Greater China; Japan, Korea & Micronesia, and; Southeast Asia & India. For the 2015/2016 edition, SEA saw 157 team members across 27 properties in the region participating and competing for the honors of winning the ‘Cups’ across the five disciplines— Bar, Culinary, Pastry, Sommelier and Barista – at the SEA & India F&B Masters. The clustered countries semifinals took off end 2015 at DoubleTree by Hilton Jakarta-Diponegoro for the Singapore and Indonesia hotels; Hilton Colombo for Sri Lanka and the Maldives hotels; Millennium Hilton Bangkok for the Thailand and Myanmar hotels; and Hilton Kuala Lumpur for the Malaysia and Vietnam hotels. “Winning the competition in Sri Lanka was a very proud moment for me,” said Rakesh, the winner from Conrad Maldives. “I reflected on what it took to get me there and it made me realize there cannot be success without time and hard work,” he added. “Without a doubt, F&B Masters has proven yet again to be a fantastic platform to showcase team member talents and capabilities,” adds Jon Warmington, general manager, Hilton Kuching, also F&B Masters champion for SEA. Follow the competition either on the respective SEA hotel’s Facebook page or by searching the hashtag #HiltonFnBstars. Conrad Maldives Rangali Island is delighted to announce that our resort Cellar Master Rakesh Shetty took out the F&B Masters Barista Cup in the country level competitions held at the Hilton Colombo in November 2015. Inspired by his first job as a barista in a coffee shop in India, Rakesh won over the judges with his inventive creation, I. A.M Latte. 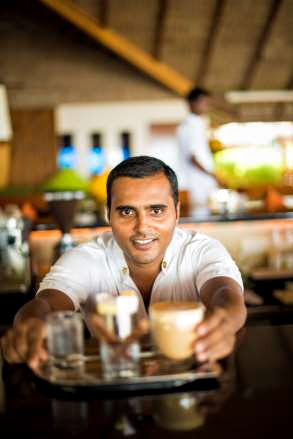 Rakesh will be heading to Bangkok in February to represent Conrad Maldives in the South East Asian Finals. How many years have you worked in F&B? What types of roles you have worked in and where? 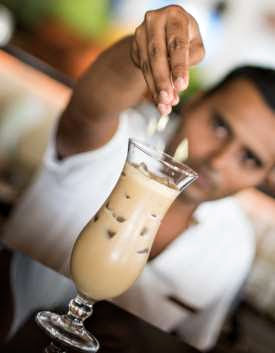 I started my hospitality career working as a Barista for eight months in one of the busiest coffee outlets in Mumbai. I then worked as waiter with the Taj Group for eight years in India and Maldives. I worked in a number of roles at varying properties including bar manager at Taj Exotica Maldives, Sommelier at one and Only Reethi Rah and now my best role yet, Cellar Master at Conrad Maldives Rangali Island. It is hard work, however, I am enjoying every minute of it. Why did you choose to take part in the barista cup? I have never been involved in a competition like this before and since I started my career as a barista, I thought it was an appropriate choice. This was a way of getting back in touch with that part of my life and reminding myself of how I got here. Winning the competition in Sri Lanka was a very proud moment for me. I reflected on what it took to get me there and it made me realize there cannot be success without time and hard work. Advice for future participants and other baristas? Take time to develop your skills and try to improve your product the best you can. Finding resources to develop your trade is much easier now. For example YouTube videos have helped me a lot to improve my milk frothing skills. Search for a better way to make your cappuccino. There is an increasing demand for non-dairy alternatives like soya and rice milk. I wanted to do something different and a bit upscale with almonds and Macadamia milk. Yes, it takes a lot of time to prepare, however, the best things always do. 1/2 cup/50 grams macadamia nuts. 1/3 cup/40 grams pitted dates. Espresso and 1 liter filtered water. The F&B Masters is an internal competition open to employees within Hilton Worldwide properties across the Asia Pacific. The competition was successfully held in Southeast Asia in 2014 and, with growing momentum and interest, it has now been extended across the Asia Pacific this year. The F&B Masters is a multifaceted competition that aims to discover, develop and celebrate the best food and beverage talent within Hilton Worldwide properties across the Asia Pacific. The competition has four different categories.